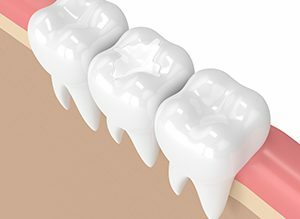 A cavity – also called dental caries – is a hole caused by a sticky substance called plaque that has eaten away at the tooth and can deepen over time. Left untreated, it can lead to a tooth abscess (infection) or destruction of the inside of the tooth (pulp), ending in tooth loss by extraction. And, one missing tooth left untreated may end in a mouthful of missing teeth. If you have a cavity, it’s important to get it repaired. To treat a cavity your dentist will remove the decayed part of the tooth and then fill the area with protective filling material. Options include traditional amalgam (metal) fillings and composite fillings (white fillings) that fill a tooth effectively whilst blending in naturally to maintain the aesthetics of your smile. Layers of super-strength, the tooth-coloured filling material is perfectly matched and then skillfully built up to look and function like natural teeth to offer long-lasting results. Tooth-coloured fillings are fast becoming the treatment of choice for our patients because they provide natural looking and cosmetically pleasing results to create a bright smile. Dental fillings are an instant and effective solution to repair and maintain the health of your teeth without having them removed. We believe in conserving your natural teeth wherever possible. Ask one of our team about your smile restoration options.